There is a lot of research already available on this topic. Unfortunately, most of the research is for marketing emails, not survey invitations. There is little consensus on this topic: some research indicates that Wednesday is the ideal day to send out a survey and another indicates that Monday is better. Some of the research is old and with more and more mobile respondents, things may have changed. The available research also doesn’t split the data by target audience (B2B, B2C) or any other useful indicator (like survey length). We could do better. To find out the best time to send out surveys we used a sample of 1,500 surveys conducted with the CheckMarket Survey Tool with the following parameters. Business To Consumer (B2C) surveys. Business To Business (B2B) surveys. Survey email invitations sent by our survey platform. We analyzed the relationship between the moment email invitations were sent out – both day and time – and the % of completed surveys. 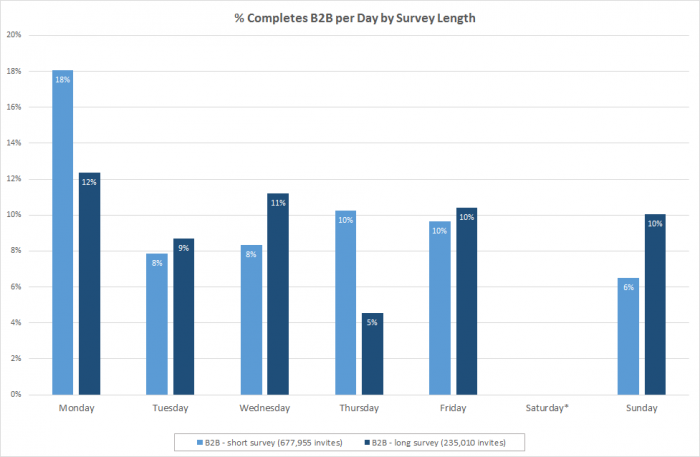 This data was further split up by type of survey (B2B/B2C) and survey length (≤15 minutes and > 15 minutes). As our clients often use reminder emails to increase the completion rate, we only included surveys completed before reminders were sent, in order to avoid biased results. Below you can find a summary table of the data we used. What’s the best day to send email invites? 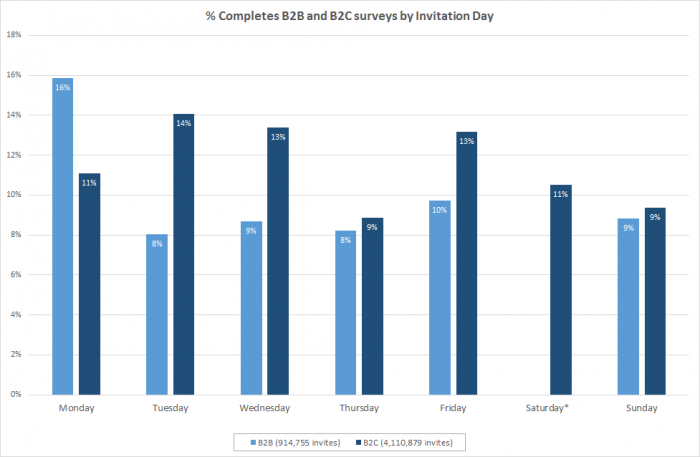 For B2B surveys, Monday is clearly the best day to get the highest amount of completes. For B2C there is not a single best day to send out: Tuesdays, Wednesdays and Fridays all lead to a relative high response rates and Thursdays and Sundays can better be avoided. The chart shows us that for short surveys Monday remains the best day. However, for longer surveys there is not one clear day that stands out: these can be sent on Monday, Wednesday, Friday and even Sunday with little difference in completion rates. Splitting the B2C data by survey length leads to some really interesting insights. 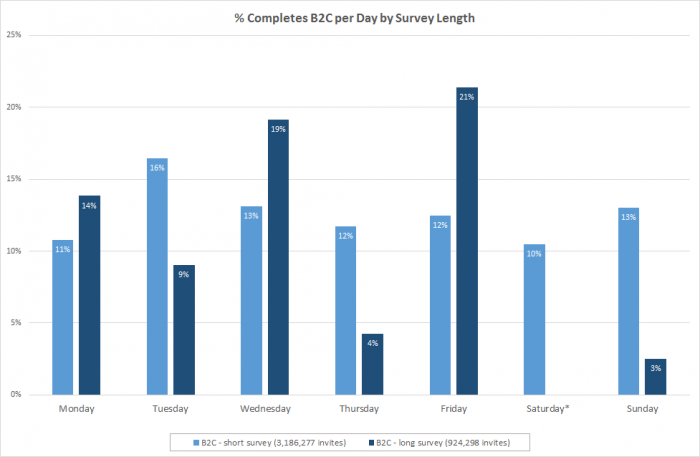 Whereas Tuesday is the best day for short B2C surveys, Wednesday and Friday are the best days for long surveys. Obviously, people need to take more time for longer surveys and Wednesdays and Fridays are usually typical days for part-time employees to be off and thus lead to higher availability to fill out extended surveys. 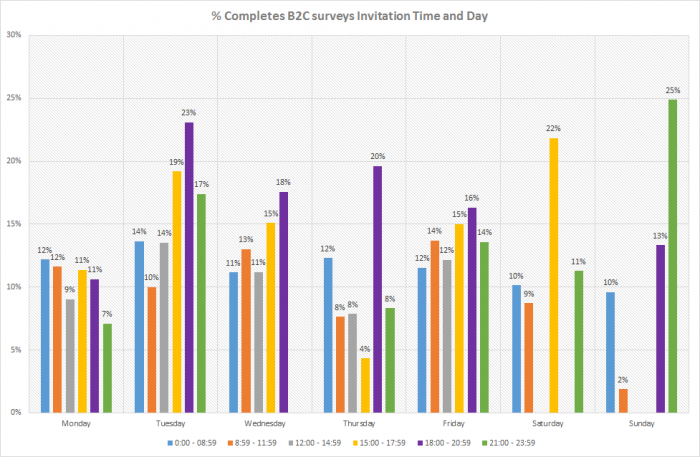 What’s the best time to send a survey email invite? 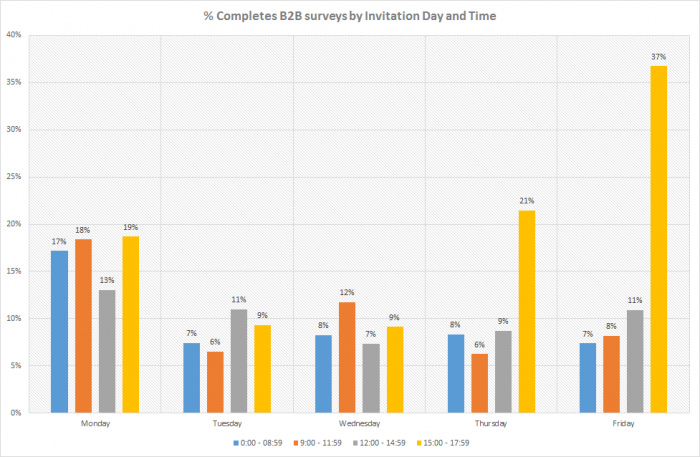 We already saw earlier that Monday is the best day to send email invitations for B2B surveys. Our data shows that Monday morning or later in the afternoon between 3 and 6 o’clock is a good moment to send out email invitations. Sending out on Monday between 12:00 – 14:59 should ideally be avoided. Possibly people are too occupied with work obligations around this time and are more likely to ignore the email (the Click Through Ratio is also much lower for this time). Furthermore, sending out on Thursday and Friday between 15:00 and 17:59 is favorable, although we have to be careful here with drawing conclusions as the amount of invites are relatively low. For B2C surveys sending out between 18:00 and 20:59 generally works best, with Mondays being the exception. In the weekend, inviting people on Saturday between 15:00 and 17:59 and on Sunday between 21:00 – 23:59 also leads to a high completion rate. It is important to keep in mind that the time you send out your survey is one among many factors that determine the response rate of your survey. 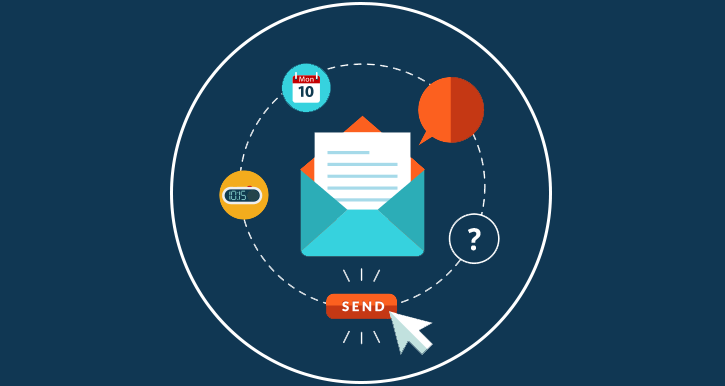 The response rate also strongly depends on other factors like the email invitation (subject line, from name and body), and the first page of your survey (branding, incentive, first question). Also the quality of your contact list is crucial for the success of your survey. If this is a targeted audience that is engaged with the survey topic, the response rate will be much higher! The results of our research gives a good indication on when to send out your survey. However, keep in mind that these results are based on the general population and what works for this population may not always work for your target audience. If using these general indications don’t lead to the desired response, we advise you to experiment with other timings using A/B testing. This can be done easily in the CheckMarket Survey Tool. Please share your thoughts with us. Do these outcomes resonate with your experiences? No CheckMarket account yet? Get started for free. Regarding response rates related to time of day that survey invitations are sent, were any correlations done on time zone response rates? Were results adjusted for the time zone differences for when recipients receive the invite, versus when they are sent by the survey owner? This is extremely useful! I am planning a sub-15min intranet survey this week — guess I’ll hold off until Monday! Thanks for these tasty data-derived insights, Gert! You da real MVP! Great to see some stats on this, thanks. Couple of questions, which country was this based in? Do you believe Australia would reflect similar? And what category/survey topics were in this analysis? A range? Thanks. Thanks for your comment. We used a balanced sample size that reflects the timing users send email invitations for which we were sure about the type (B2B, B2C), the size of the panel and other quality criteria. For B2B on Thursday and Friday between 15:00 and 17:59 we had respectively about 7,800 and 5,000 email invitations. It is not often done! But maybe it should be! That is a small sample which is why we mentioned in the article to be careful drawing conclusions based on these relatively low counts compared to the amounts in this time slot for other days. Have you seen similar results? Looking forward to your feedback. Willem – This is a great piece. As it is now over three years old, is there any chance for the subject matter to be revisited? If not, are there any any other studies that can be resourced? Thanks for your comment. We will try to publish an update of the article by the end of the year. Interesting work, thanks for sharing your results. What are your sample sizes for, say, the Thursday and Friday 15-17:59 B2B email time slots, if you don’t mind sharing?